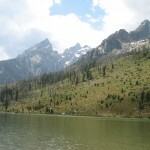 Most guidebooks will have you park in the South Jenny Lake parking lot and walk three miles around the lake to the beginning of trail leading to Inspiration Point. 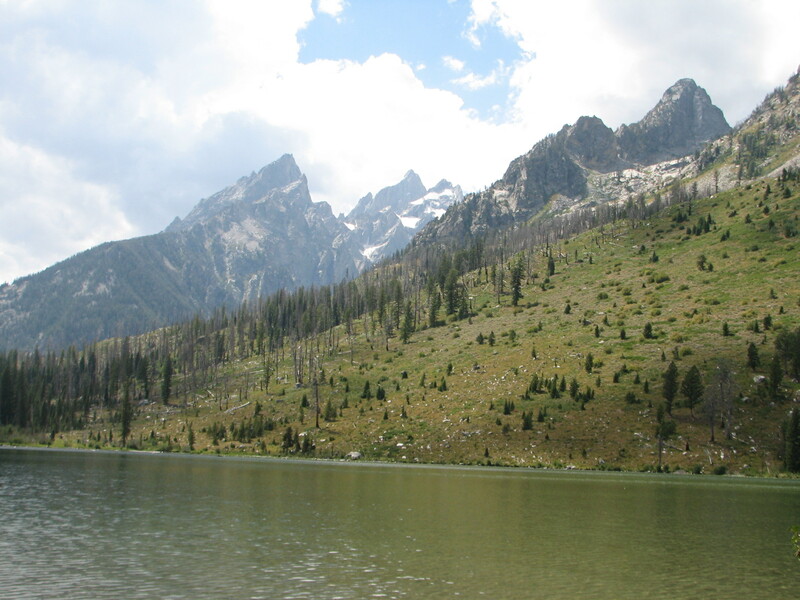 Alternatively, they will point out the option of taking a boat from the Jenny Lake Boat dock. Not me. Instead you should drive to String Lake. 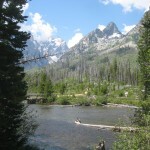 You can reach it by heading ten miles north of the Moose Entrance to Grand Teton National Park. Turn left at the signed North Jenny Lake Junction. It is another one and a half miles to the String Lake parking lot access road on the right. There are three lots, park in the first one. If it is full, you can go to one of the others, get out of the car, head for the lake and turn left on the trail until you reach the first lot. From the first parking lot head south, following the short trail that skirts the eastern edge of the lake. Within a couple of hundred yards you will see a bridge on your right cross it, or perhaps stop in the middle and marvel at the view. 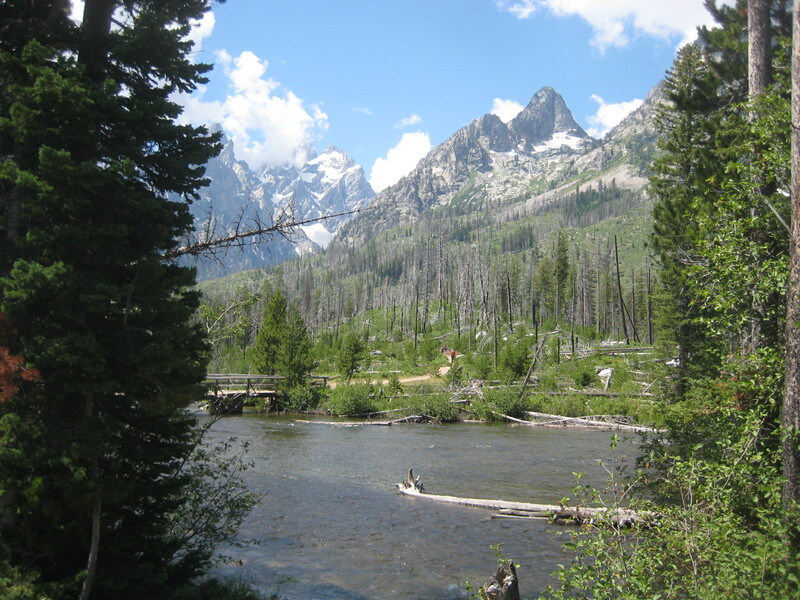 An Idyllic hike that combines rushing rivers, wooden bridges, and a beautiful lake with a mountain backdrop can be had by parking at the Laurance S. Rockefeller Preserve Center and following the Lake Creek Trail to Phelps Lake. Along the way you will cross three bridges, hike gentle switchbacks up and down forested hills, and arrive at a large lake with a tempting bench to sit on. This can all be accomplished within slightly less than a three mile roundtrip. If you like mountains, rushing streams, a gorgeous lake, and a waterfall to boot, then this 4 mile round trip hike is for you. Perhaps long stretches of shade, open terrain recovering from a forest fire and minor elevation gain would interest you as well. The trip starts in the String Lake parking lot. It probably was once a river channel connecting Jenny Lake to the South and Leigh Lake to the North. Now, String Lake is nothing short of a spectacular narrow body of sparkling water ringed on its Western and South Western sides by majestic mountains that seemingly stretch from the shore to the clouds. On its eastern shore are numerous small beaches, some immediately adjacent to the parking lot and others to the North that provide some semblance of privacy. The trail that rings the lake is easy, especially the stretch from the parking lot north to the bridge that crosses a mild set of rapids to the Western side (about a fifteen minute walk). The shaded walk keeps you in close contact with the water on the left and the woods on the right. Should you want to go further, after crossing the bridge follow the trail for another couple of hundred yards until you reach a branch heading South (to your left). It will lead you back to your starting point in another hour after first circling the lake. Ok. I can’t believe I am recommending a franchise. I can’t believe I am recommending that you go all the way to Jackson Hole and then frequent an eatery that you might have back home. 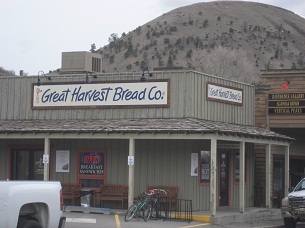 However, this ain’t just your ordinary Great Harvest Bread Company store (and the ordinary ones are pretty darned good too!). This bakery is special – at least it is to me and everybody I have brought in there. It is quite different than the franchise that is located where I live. The owners appear to have taken special care to put their own distinctive twist on the brand. It starts with the free samples. 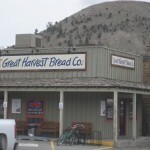 They offer you gigantic portions of several different types of bread, swathed in butter or jelly that, except for your guilt, would be enough to eat along with their Snake River Roaster coffee sold by the cup. However, even though they serve fine looking breakfasts that is not what brings me in. Even the tempting smells emanating from the freshly baked loaves of bread would not necessarily warrant a stop there an almost command performance. or 9 other specialty sandwiches. 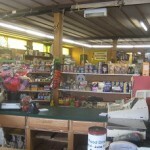 Along with all this you get the benefit of a small grocery ( a clean bathroom for those in need) and personal assistance. 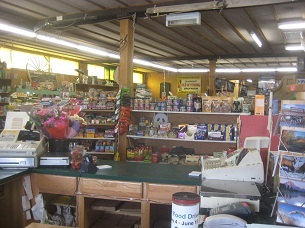 It is located at 545 N. Cache Rd. ( the main road heading north out of town). 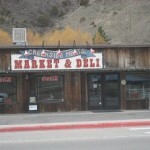 As you are leaving town, you will see a long low strip center on your left. 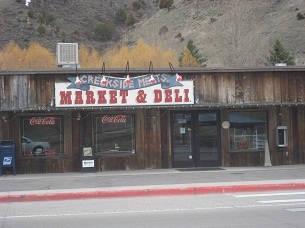 The Deli is located in the middle of the structure. 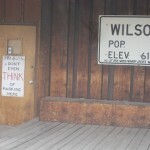 If you are heading west towards Teton pass, you will enter the town of Wilson just before the road begins its ascent over the mountains. 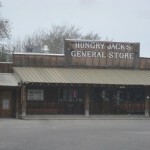 The town is small and unassuming, but contains a gem that should not be missed – Hungry Jack’s General Store. 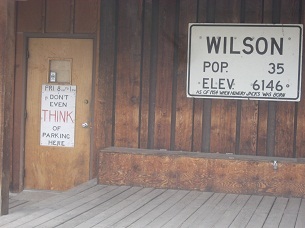 It will be on your right (north side of the road), just to the left of the Post Office. If ever you wanted to step into culture of the past fused with the products of the present this is it. 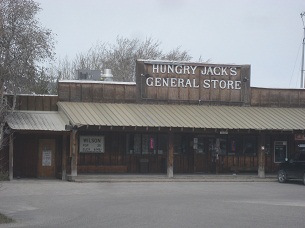 Hungry Jack’s is a general store where you can pick up basic grocery items, clothing, DVDs, etc. in an eclectic menagerie that harkens to the working West. I usually enter thinking of one or two things that I need, and leave with having not found them but being drawn to purchasing several other items that catch my passing fancy. It is a store that you feel good about making a purchase in. It has a family run atmosphere that shakes you free from the corporate retail culture that we have all become used to navigating. When you leave with a pair of work gloves with Jackson Hole insignia, Carhartt jeans or some other item you feel you are also leaving with a piece of this wonderful valley. 1) Saddles to Sushi– The author, Mike Bressler, is an unheralded author outside of the valley whose outdoorsmen look belies his prodigious talent. I met him for the first time at a writer’s group in the Art’s Center in Jackson Hole (I doubt he remembers me now). I was captivated as he read a short story about Clyde Thornhill, the subject of the story and the protagonist in Saddles to Sushi, which is an anthology of Clyde’s life. Recently, while browsing through the Valley Book Store I was pleased to run across a copy of his book and purchased it immediately. As I read it I wondered if I was learning about Clyde, Mike or both. Nevertheless, it never ceases to be entertaining and irreverent but somehow also relevant. In the process of exploring Clyde’s relationships with; Susie, his feminist liberal lover; Alice, his Republican lover; or Lill, his redneck lover – you will become immersed in one man’s perspective of the subtle sub culture in Jackson Hole. Each of the approximately 65 short stores will leave you in stitches, but scratching your head from the folksy wisdom of a man on the prowl. The stories center one man’s eternal search for black lace, simple pleasures and biscuits and gravy in the morning, and . The backdrop is an often hilarious overview of Jackson Hole’s restaraunts, art galleries, and political lumineries.